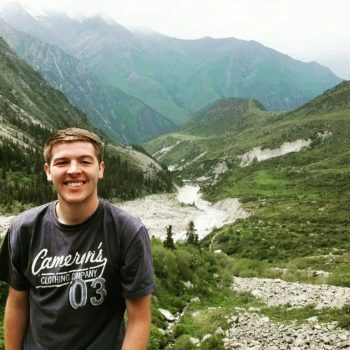 Summer in Kyrgyzstan The Critical Language Scholarship Program has allowed Riley Ries '19 to strengthen his Russian and learn more about politics and culture in Kyrgyzstan. 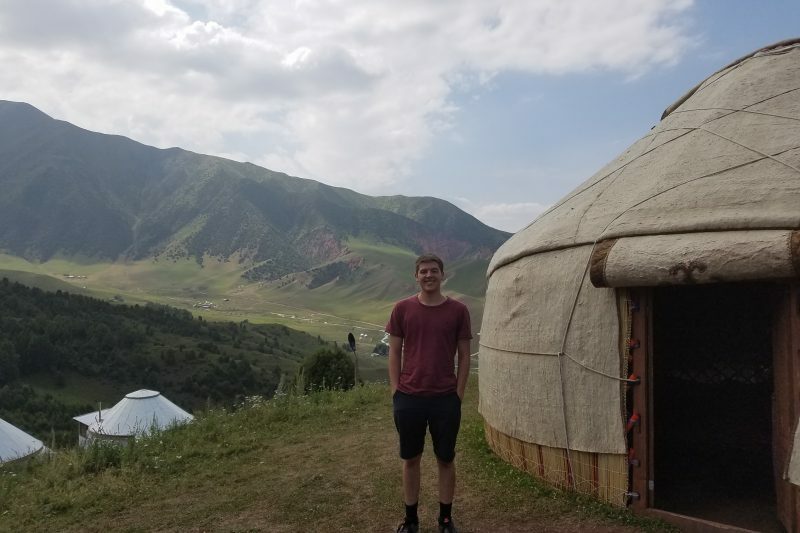 Riley Ries ’19 stands next to a yurt in the mountains of Kyrgyzstan. What is the CLS (Critical Language Scholarship) program? CLS Bishkek is a two-month, intensive Russian language-learning program sponsored through the U.S. Department of State, Bureau of Educational and Cultural Affairs. Students spend 20 hours per week in class plus additional cultural excursions (museums, theater, hiking, etc.). Each student also takes on an individual research project, culminating in a paper and presentation. Students live with host families. Tell is more about your individual research project. I am researching cattle, beef and dairy production in Kyrgyzstan and the role it plays in the heavily agriculture-based Kyrgyz economy. In addition to information taken from news articles and government and academic resources, I have been speaking with local ranchers and dairy farmers, asking acquaintances about their beef and dairy purchasing habits (i.e. from a supermarket or directly from farmers at street-side stalls), and plan to visit a local dairy processing plant. Riley with Bermet Zhumakadyr Kyzy, a CLS language partner who studied at W&L as an exchange student during the 2010-2011 academic year. I found out about CLS from Professor Marcia France when she was Associate Dean of the College and headed up advisement services for fellowship applications. Additionally, I asked former CLS recipients at W&L, such as John Anderson ’16 and Tara Cooper ’19, for insights into their experiences with the program. I sought this scholarship in order to improve my Russian-language skills and cultural and political understanding of the post-Soviet space. Breakfast usually consists of kasha (similar to oatmeal), fresh fruit and bread. After breakfast, I head off to the American University of Central Asia. Classes, taught entirely in Russian, cover Russian grammar, conversation and phonetics. There are also additional classes on Russian-language theater and poetry and basic Kyrgyz. Two days per week, the program arranges cultural excursions to places in and around Bishkek, such as museums, theaters or the Kyrgyz marriage registry office. While at school and on cultural excursions, students are held to a “language pledge,” speaking to one another only in Russian. Riles with his host mother, Madina, and baby sister, Fidelia. On free days, I spend time with friends or my language partner, a Kyrgyz college student, exploring the city by visiting local parks and bazaars, or simply wandering through the streets. In the evenings I eat dinner with my host family. My host mom prepares national dishes such as plov, liver pies or sheep’s heart. There is always fresh fruit and bread available. After dinner, my family and I enjoy conversation with one another over a few cups of tea. What is it like to live with a host family? 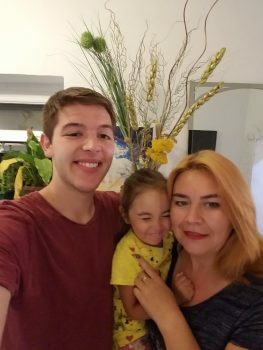 Living with a host family has been by far the most rewarding part of my experience here in Kyrgyzstan. 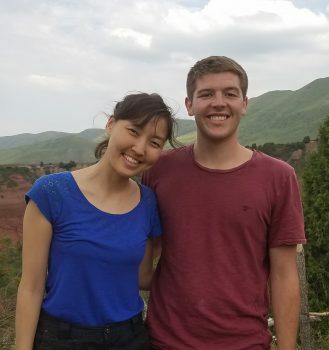 With my host family, I get to hammer in new grammar concepts and vocabulary studied in class, learn about local life and culture from native Kyrgyz, and explore the city as can only be done with a resident. What has been your favorite experience so far living in Kyrgyzstan? Kyrgyzstan is rich in natural beauty, and my friends and I have taken every opportunity possible to spend time outside of Bishkek exploring all that Kyrgyzstan, not just the capital, has to offer. My favorite of these experiences was hiking through the mountains near Osh. We spent an entire day soaking in the beautiful scenery of southern Kyrgyzstan and talking with our guides about their experiences growing up as nomadic sheep and horse herdsmen. We also got to watch a game of Kyrgyzstan’s national sport: Kok Boru. Similar to polo, it is played on horseback and involves riders vying over a headless goat carcass. Q: Has it been challenging in any way? If so, how? CLS has been incredibly challenging. Between the huge time commitment for program activities and the desire to explore all that Kyrgyzstan has to offer, there has been very little free time this summer. In addition to this, my entire life is conducted almost entirely in Russian, even when I’m with friends outside of class, which can become very tiring and challenging. But these challenges are exactly what make the program so effective and rewarding, and have allowed me to significantly improve my Russian-language skills and understanding of Kyrgyz culture. Q: How has this experience related to your larger professional or personal goals? My experiences and studies this summer have significantly improved my Russian-language skills and understanding of post-Soviet politics, economics, social problems and so on. This knowledge will be incredibly important to me in my capacity as a foreign affairs/defense specialist. Before this summer, I was mostly interested in the politics of more Western post-Soviet republics, namely Russia, Belarus and Ukraine. However, this summer has really piqued my interest in Central Asia and the history, politics, economics, culture and natural beauty of the region. The challenging coursework and high academic standards expected by professors at W&L, specifically in the Russian Area Studies Program, prepared me well for the CLS Program. Why is this kind of experience important to the liberal arts education for W&L students? In order for students to become truly well-rounded, which is the purpose of a liberal arts education, it is essential for them to have a solid understanding of the history of and problems faced by people from other cultures than their own. The best way to achieve this understanding is by spending time immersed in those cultures, for instance by living with a host family and spending time conversing with local friends. 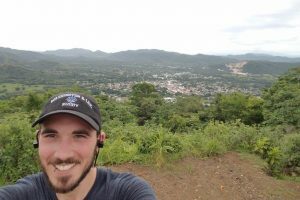 The CLS Program seeks to increase cross-cultural opportunities through experiences such as these all across the world, and does so very effectively. Professors Richard Bidlack and Anna Brodsky have both been phenomenal mentors throughout my time at W&L. Not only do they push students with challenging coursework, but they also encourage students to apply for such unique and fulfilling opportunities as CLS and the Fulbright Program, supporting and advising us throughout the entire application and educational processes. I like Cookout, where I order the Cookout tray with a big double burger, onion rings, fries and a chocolate cherry shake.